The K-800 AS is Kawai’s imposing upright piano flagship, developed and built in Japan to give the best possible playing and listening experience in an upright cabinet. This is a piano that can comfortably satisfy and challenge the most demanding pianists. 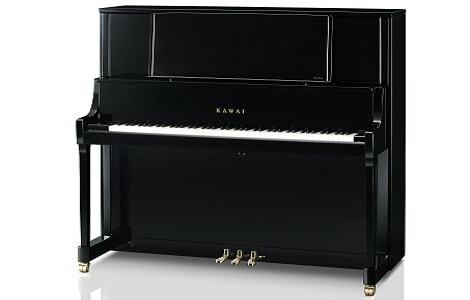 The K-800 AS is Kawai’s imposing upright piano flagship, developed and built in Japan to give the best possible playing and listening experience in an upright cabinet. This is a piano that can comfortably satisfy and challenge the most demanding pianists, but also inspire less experienced players to explore a vast range of expressive colour in their playing, and to develop into more searching, communicative musicians. The clarity of sound and tonal flexibility, enhanced by the Royal George hammer felts, work in synergy with the precision of the Millennium III action to expose the finer nuances of your playing, encouraging a constant cycle of listening and response. Behind the grand piano-style music desk (with the same hard finish as the GX-Series grands) there are sound holes in the front panel to provide more of the direct involvement of a grand piano. The inclusion of a sostenuto pedal is invaluable for those works in which you would make use of it on a grand piano (some Ravel and Liszt works spring to mind), and Kawai have incorporated a celeste rail for quieter practice, operated by a discreet lever underneath the bass end of the keyboard. K-800 AS is used in the most demanding situations. Four were recently delivered to the Yehudi Menuhin School. As with all Kawai acoustic upright and grand pianos, the K-800 AS comes with a 10 year warranty (five years parts and labour, and a further five years parts).